Many repair operations for congenital heart defects involve the replacement of valves and/or the insertion of conduits (basically tubes) to redirect blood flow. Most surgically implanted valves or conduits will last 10-20 years before they wear out, become obstructed, or lose efficiency. When their function becomes impaired for any of these reasons, replacement becomes necessary. Implanted conduits may be made of pericardium (from the sac-like membrane that envelopes the heart), human or bovine pulmonary arteries or aortas, Dacron®, or Goretex®. Metallic conduits are no longer used in the pulmonary circulation because of the risk of thrombosis (clot formation). 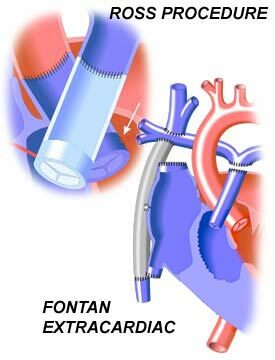 In some cases, conduits may be supported by internal stents. Unfortunately, implanted conduits will become stenotic over time, requiring their replacement. Conduits may develop obstructions because of kinking, thrombus (blood clots), or fibrous tissue ingrowth (scarring) at either the ventricular or pulmonary insertion sites. If the conduit also contains a valve, the valve in the conduit will usually calcify over time and become less mobile and stenotic. When an obstruction is suspected, a catheterization may be performed to determine the degree and location of the narrowing. In some cases, conduit stenosis may be responsible for a decline in the efficiency of the tricuspid valve (between the right atrium and right ventricle), resulting in regurgitation of the valve. This may require a valve repair operation, known as a tricuspid annuloplasty, in which the valve is strengthened by the insertion of a ring around its periphery. Both mechanical and bioprosthetic homograft (human) and allograft (animal) implanted valves will eventually need to be repaired or replaced. An exception to this is with the Ross Procedure, in which the aortic valve is replaced with the patient's own pulmonary valve, which is capable of growth and renewal. However, these patients will receive a replacement pulmonary valve, which will eventually wear out. Risks associated with prosthetic valves include the development of valve-related endocarditis (valvular infection), the deterioration of bioprostheses (human or animal valves), embolism formation, and, in the case of mechanical valves, thrombosis may occur. Before a valve or conduit replacement operation is attempted, the condition of the pulmonary and coronary arteries will need to be determined. (The pulmonary arteries carry blood from the heart to the lungs; the coronary arteries carry blood from the aorta to the heart muscle itself.) Sometimes, the deterioration of the valve or conduit occurs in conjunction with changes in these vessels, or in other areas, which may also need modification.